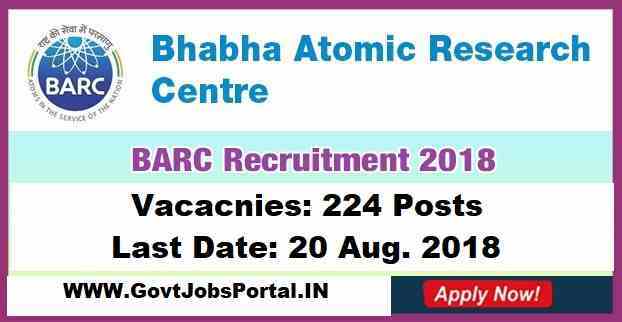 BHABHA ATOMIC RESEARCH CENTRE Recruitment department is inviting all Indian candidates to apply for various vacant positions in this department. So those who are eligible for these Government jobs can apply online. We share more information related to this recruitment process below. Pay band: Rs.10,500 Per Month. 10th pass and should have 60% marks in Science and Maths as well as in aggregate and also have an ITI trade certificate. What is the Selection Process for this BARC Recruitment 2018? Selection Method Category-I Post: Written Examination of one hour duration will be conducted and will comprise of 40 objective (multiple) type questions. The syllabus for the said examination will be based on subjects at Diploma/B.Sc. level as the case may be. Those candidates qualifying in the written examination shall be short-listed for interview to be held on the following day. ‘3’ marks for each correct answer and ‘1’ mark will be deducted for each incorrect answer. Final selection and ranking will be on the basis of performance of the candidate in interview and no weightage will be given for marks scored in the written examination. The decision of this Research Centre in this regard is final. Selection Method for Category-II Posts: The selection process will consist of tests in 3 stages – Stage 1, Stage 2 & Stage 3. Stage1 - Preliminary Test : Screening examinations to be held to shortlist candidates. The format of the screening examinations will be common for all trades and will be in the following format. 2. ‘3’ marks for each correct answer and ‘1’ mark will be deducted for each incorrect answer. What is the process for Applying this BARC Recruitment 2018? 3. For online submission of application, please visit the website . Applicants are recommended to read directions given on home page of BARC website by clicking the option “How to apply”. For the posts of Category-I: Rs.150/- Fee is exempted for candidates belonging to SC/ST, PWD and Women category. For the posts of Category-II: Rs.100/- Fee is exempted for candidates belonging to SC/ST, PWD, Ex-serviceman and Women category. • The Application number generated after the submission of the application is required to make the online payment of the application fee and hence submission of application is mandatory before the online payment of application fees. However, fee NOT paid will be treated as incomplete application and hence will be rejected. • For payment of fee, candidates should click on the ‘Make Payment’ option under the ‘My Account’ menu. The Application number generated while submission of application can be selected from the Drop-down box and on clicking the ‘submit’ button candidates can go to the next pages for making the online payment. • Detailed guidelines for payment of application fee is available under the menu “How to ApplyàPayment of fees”. • Fee once paid shall not be refunded under any circumstances and cannot be held in reserve for any other recruitment. • Application fee should be paid on or before the last date of receipt of online applications. 28th July 2018 is the Starting Dates to Apply.